A propagation of Mach 2 and 3 plane shock wave through the air containing cylindrical cloud of low-concentration quartz dust is numerically modeled using Euler’s equations. One-velocity single-temperature model of dust-air mixture is used. 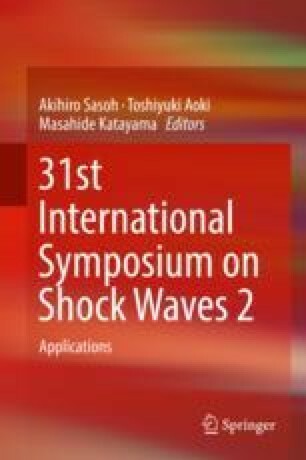 A refraction of incident shock and formation and focusing of transversal shocks are described. Two qualitatively different interaction patterns – external and internal – are found to take place for different dust concentration values. A dependence of peak shock focusing point position and relative shock focusing intensity on volume concentration of dust in range from 0.01 to 0.15% is determined. With increase of dust concentration peak focusing point draws near the cloud edge and moves inside the cloud, while focusing intensity non-monotonically rises.